I am opting for brain surgery as soon as possible, which is likely to be early June. I know that leaves out a lot of details. But don’t worry — things aren’t dire. Well, they might be. Who knows? That’s the problem — no one knows. It’s all a big gamble; each choice having compelling pros and cons. My resolve is as strong as it has always been. It’s just my spirit that’s taken a trouncing. Expect I’ll be fine tomorrow. I keep thinking that I’m being overly dramatic. But, this is kind of dramatic. As always, I appreciate the flood of support. Some of you have accused me of writing a post that inspired you. If I had to share my latest advice, it would be… to love. It’s simple and cliché. But everything we are can really be boiled down to Love — the basic unit of our being. Is this unconscious knowledge? If so, it must be easy to overlook; neglect; take for granted; or underestimate or else societies and our world would be a much more wonderful place in which to live. Don’t wait for a brush with mortality to embrace this. Live this and impress it on the youth. I don’t wish a “brush with mortality” on anyone, but it seems to be effective. My final design for the 10th anniversary t-shirt. A group of fine people I’ve had the honor to ride with for over a decade. Specific updates, in case I’m not able to reach everyone. 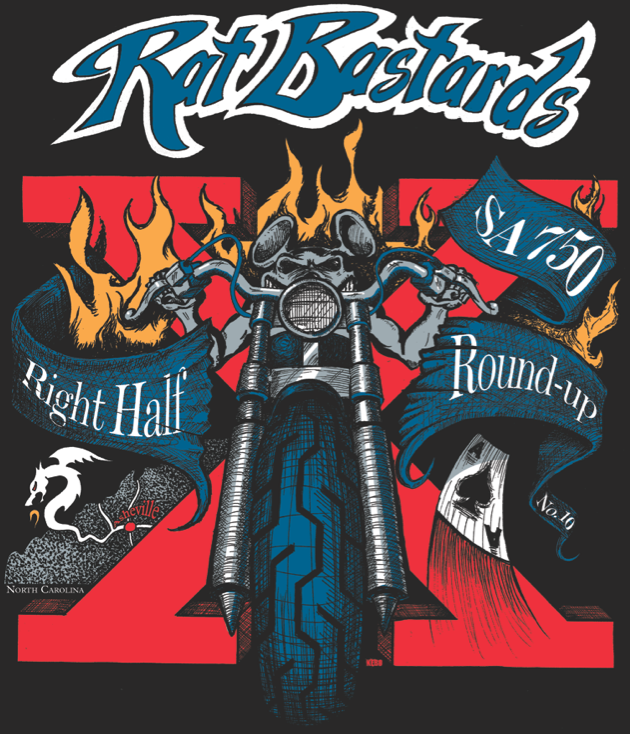 Rat Bastards — I was so looking forward to riding to RHR X. Against odds, I still hold out hope. Shirts will get to you one way or the other, sooner or later. Cotton clan — let’s call Florida postponed, not cancelled. Maybe even still on? Maiden crew — not sure StapleHead will be ready to rock in time. Come by for a round of Grazers, though. Georgia friends — I have a week or two to connect before going under the knife. Afterwards, I may be fragile for a while. Don’t take offense if I get a little (more) anti-social. Alabama friends — not sure if UAB treatments will continue. We’re not done visiting though. R. Phillips — I’ll do my best to keep in touch and get together in the coming weeks. Thanks for the first-hand advice and support. Good luck with your battles. Maudsley’s — see you soon. It would take eternity to explain exactly what all I mean when I say that to you. Again, a three-sentence update, evolves into a long ramble into the wee hours. There’s no useful information in this post. I do have a meeting with the Emory neurosurgeon this afternoon and will report back. Below is just a curiosity I wanted to share. 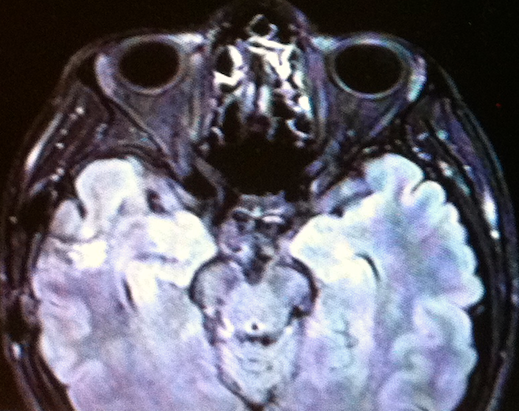 When I viewed my latest MRI image, the one shown in my previous post, I saw a human form with two faces in the middle of the image (between the two hemispheres). A horned head and a face in the abdomen. 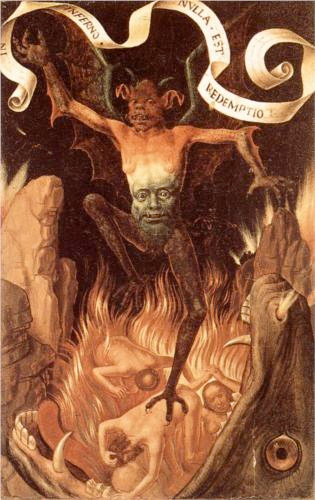 This morning, by chance, I happened upon an oil on wood painting by Hans Memling called “Hell” done in 1485. I was struck by the similarity of the images. I understand if you don’t see it (or if you don’t want to see it). I had an MRI at UAB today. The scans reveal abnormalities that are likely to be either treatment effects or tumor growth. Treatment effects — The clinical trial is relatively new. Maybe this is just some harmless byproduct of the treatment. (They figure this out as they go.) Maybe it’s no big deal. Tumor growth — Very bad news. In order to consider a treatment we must determine what exactly is going on. This means surgery — another craniotomy, similar to the first time. If it’s a tumor then I’ll be removed from the ICT-107 clinical trial. I would be eligible for some other interesting trials. I would likely begin receiving Avastin (an intravenous chemotherapy). But while they’re in there, surgeons would attempt to remove as much tumor as possible, which is supposed to be good news in some desperate way. I suppose the best (and less-likely) outcome would be to find that it is just some unexpected, unharmful stuff which can be removed and studied at great benefit to the medical community (or great profit for the trial sponsor). I’m going to sleep for 14 hours now. I’ll get in touch with Emory for further consultation tomorrow and keep you posted. But before I go, I want to mention that I know it’s been a long time since I published an update here. I have composed one hundred of them, but none I felt needed to be shared. Today’s post was going to inform you that, rather than post all the time about how well I’m doing, I was only going to post if something bad happens. Well, I’m right on schedule.